Lakelands ranks as one of the Gold Coast's premier golf courses which was personally designed by eternal golfing legend, Jack Nicklaus. 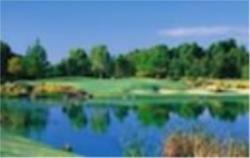 This designer course perpetually remains in immaculate condition, and its 18 hole, 72 par construction encompasses such scenic natural surrounds as a cascading waterfall, picturesque forest environments, and an overall open feeling of sheer greenery that makes any golfing day at Lakelands a special event. The course also offers an extensive practice facility with five target greens and undercover hitting bays to help accommodate visitors during inclement weather. This gift voucher includes an 18 hole round of golf at Lakelands along with hire fees for a motorised golf cart. Lakelands definitely offers one of the most satisfy golfing experiences in the entirety of Queensland! Lakelands Golf Club is located at 100 Lakelands Drive, Merrimac, Gold Coast.